veryone else is asleep when I wake up at 8:00AM, so I creep out for a look around. OK, I get dressed first. I thought I had better mention that in case you have this mental picture of me strolling naked round the Boardwalk, wonderful sight though it would be. I grab a coffee and a cinnamon yummie from the Bakery and start to walk. This is one of those Disney moments that will last a long time. I stroll very slowly with hardly another soul around, stopping every now and then to gaze around and enjoy my breakfast. It is overcast but warm as I swing on the beach chair on the beach in front of the Yacht and Beach Club and ponder on the approaching end of our holiday. Pushing such horrible thoughts from my mind, I return to the Boardwalk. Everyone is up and they have breakfast before we leave the room. This is our non-park day and we are going to show Granny(J) a few of the resorts. As we pass the lobby I stop and ask to see the manager. Within a few minutes he comes out and I explain the events of the previous evening relating to the blocked toilet. He apologises and promises to talk to engineering and contact our room later in the day to let me know the outcome. I will keep you posted later. Out to the bus stop and we are off to the Magic Kingdom to catch the bus to Fort Wilderness. I always enjoy this trip as you seem to end up a lifetime away from the hustle and bustle of the parks. Fort Wilderness is quiet and I allow the women to do some shopping. I know, Im a saint. We walk up to the petting farm and see at least a dozen peacocks up in a tree. Tam seems to have an affinity for the Pot Bellied Pig. Cant think why. A nice stroll along the waters edge brings us to the Wilderness Lodge. A quick look around (and more shopping!) and we let the girls loose in the pool while the rest of us check out the Villas. The atrium and general recreation areas are much smaller than the Boardwalk, but this is to be expected as many facilities are shared with the Lodge. We all conclude that the richer, darker décor lends itself to a visit at Christmas. This might be helped by the Christmas decorations and music that is playing. We also get to see the 1 bedroom demonstration unit. I think that it may be slightly smaller than the Boardwalk, but very nice nonetheless. There is the typical Disney attention to detail throughout. I am sure we will spend some time here in the future when we want a quieter holiday. Back at the pool the girls are having fun so the adults head to the pool bar for cocktails and nachos. I think being round all these females is having an effect on my choice of drink! 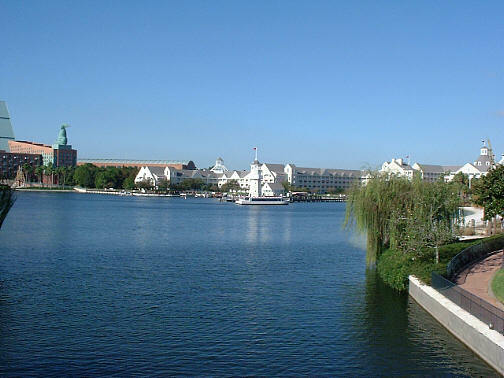 We continue our exploration by taking the boat back to the Magic Kingdom and then the monorail to the Polynesian. India has started to make a note every time she sees a different coloured monorail. So far she is up to 9. 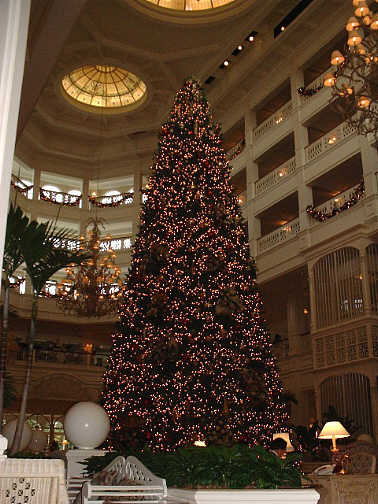 The Christmas decorations are up in the Grand Floridian and the tree is as enormous as I remember it being. The ladies are looking at the menu for the afternoon tea and, on the spur of the moment, we decide to do it. This is always a very pleasant thing to do. Beautiful surroundings and lovely service. We are all deciding which sort of tea to have. Darjeeling? English Breakfast Tea? Earl Grey? India pipes up with Do they have PG Tips? Oh, the shame of it! I blame her mother, you know. We all have the cream tea except Georgia who has a couple of pastries. The waitress spreads the napkin on your lap for you and pours your tea. All very pleasant and refined. Grandma(D) says she is paying as a treat. Very nice. In the atrium they have nearly finished the gingerbread house. You could live in this. Even Tammy would take more than one sitting to eat it all. The ladies shop for a while (told you I was in a generous mood today) while I watch the pianist playing in the atrium. Im sure there is a smutty joke there somewhere, but I shall refrain. Eventually we get the monorail back to the Magic Kingdom and the bus to the Boardwalk. Back in the room there is a message waiting from the manager. He apologises again and says that he has had the villa fully valeted, which is true. Everything is neat and tidy with the towels arranged in fancy patterns and the childrens toys placed around the room. I am reasonably happy with this, although I think they could go a little further, maybe a bunch of flowers? It was probably all worth it to see Tam with her arm stuck down the toilet and a look of pure panic on her face. Priceless. It is now 5:30PM and take the girls off for a quick swim while I write up my trip report (with beer, of course) and Granny(J) & Grandma(D) relax and get ready for the evenings activities. At 7:30PM we go the Flying Fish for our PSs. This is a very classy establishment. Like a lot of the Disney restaurants it is a little more expensive but this does not mean you get a quiet environment. It is similar to the California Grill in that the food and service are excellent, but the restaurant is quite noisy. This is indicative of the WDW experience in general. Quality, but relaxed at the same time. 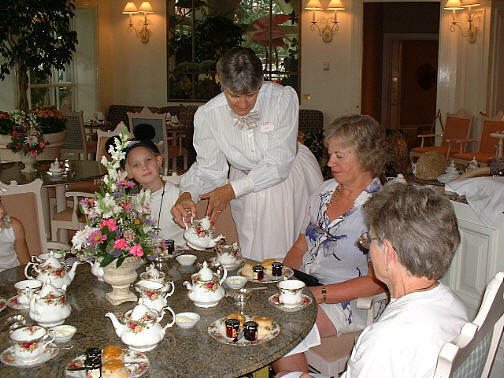 For example, this afternoon while we were having tea at the Grand Floridian, I saw a bride and party walk by closely followed by a family in t-shirts and shorts. The food in the Flying Fish is, by general agreement, the best we have had this holiday. Of course, the bill is also the highest we have had this holiday! I have the Potato Crusted Red Snapper and Tam has the Oak Smoked Wahoo. (A type of fish.) Both are excellent. The portions are not too large and the sauces are wonderful. The service is as good as we have had anywhere. The waiter gets to know the girls names and makes them involved in the meal the whole way through, talking directly to them as opposed to talking to us about them. Granny(J) pays for a bottle of wine. Not cheap at $30 a bottle, but excellent. The desserts are chocolate lava cake and banana Napoleon. Both are enjoyed. The bill for the 4 of us is $120. Not cheap, but the Flying Fish is now up there with the California Grill and Jiko as our favourite restaurants. After our meal the girls are desperate to play one of the games on the Boardwalk where you shoot a jet of water at a target and make a car climb and hit the finishing line first. It costs $3 a go. India wins and gets a bendy Kermit, a good toy for a $6 outlay. Of course, Georgia then has to try again. I think India lets her win and Georgia chooses a Mr Potato Head. The girls and I head back to the room via the arcade to let Tam, Granny(J) and Grandma(D) enjoy the pleasures of the Boardwalk. It is supposed to be an over 21 nightclub. The ladies consider Jellyrolls, but it has a $5 cover charge and is very smoky so they give it a miss. At least they will be up in time for Epcot tomorrow.